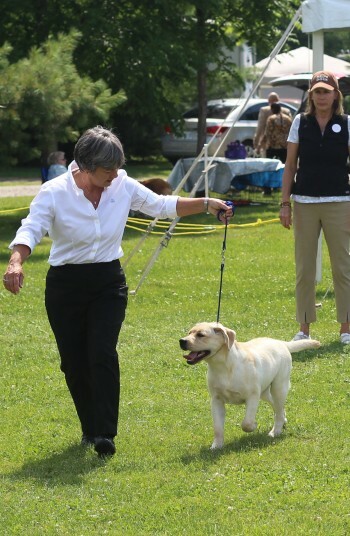 On Sunday July 27th, 2014, CH MooseLake In Motion (aka Nike) won BEST in BREED under breeder judge Maureen Gamble (Nimloth Labradors). It was an impressive line up of Labradors in the ring and an exciting, heart pounding win. 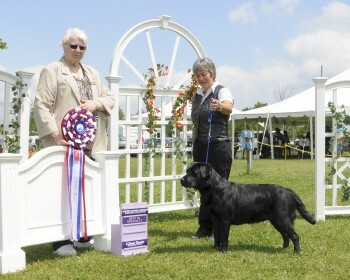 Nike was shown by owner handler Laurie and showed flawlessly. Nike turned two on July 27th so it was a great birthday present to her! We also showed MooseLake Liffey Stella, aka Stella, who on her first time in the Show ring did really well with two second placements by breeder judges Nancy Arbuckle and Maureen Gamble. We showed MooseLake’s Rebel with Cause, aka Rebel, in the baby class and he was awarded 2nd under judge Nancy Arbuckle (Hunt Club Labradors).